Councils typically deliver more than 100 community services and provide local roads, bridges and community facilities valued at $91.2 billion across Victoria. To fund these activities, councils use rates plus other revenue sources including borrowings; fees, fines and charges; asset sales; interest earned on investments; and government grants. On average, around 55 per cent of total council revenue is raised through rates. Local government depends substantially on the Australian and Victorian governments to meet its funding needs. Smaller rural councils collect less in rates revenue and are more reliant on government grants to provide services for their communities. 3.6 per cent or $355.5 million from other sources. 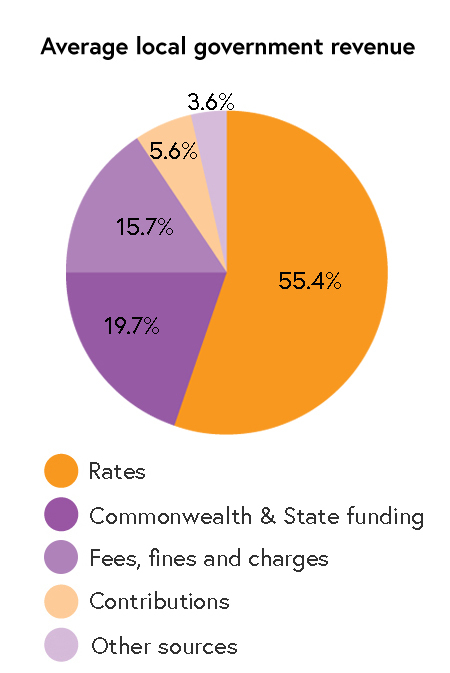 Rates can contribute as little as 29 per cent towards the total revenue of some Victorian councils, and as high as 75 per cent of revenue in other councils. Know Your Council: learn more about Council funding.